Which schedule type do I use? The 3 schedule types: Which one to use? The first choice to make when setting up a new SuperSaaS schedule is which schedule type to use. The process of scheduling an appointment differs greatly from one business to the next. SuperSaaS offers three different types of scheduling engine to allow you to pick one that closely matches your needs. The three schedule types are called the “capacity schedule”, “resource schedule”, and “service schedule”. The schedule types overlap in what they can do, and for some applications more than one will work, but you will get the best experience if you select a type appropriate for your situation. To distinguish between the types you first want to answer the question: “Can users reserve a place for the same event at the same time?”. If the answer is “yes” then you will want to use a capacity type schedule. The distinction between a “resource” type and a “service” type lies primarily in the booking process. As the name implies, the resource schedule is organized around resources (teachers, boats, rooms), and each resource can only be used by one booking at a time. The schedule shows the availability of the resource and the user picks an available spot. With a service schedule, on the other hand, the user first selects a service (a lesson, a ride, a haircut). The schedule then shows all spots that have the resources available needed for that service. We recommend that you start by creating a resource type schedule. The resource type schedule will work in most scenarios although sometimes a service-oriented process will fit better. The resource schedule should contain each “scarce resource” that is involved in the booking process. For example, scarce resources could be therapists, rooms, boats, pool tables, etc. If you are setting up a calendar to allow people to schedule an appointment with you, then you would be the scarce resource. Don’t include resources that are not scarce. For example, if an appointment needs a meeting room but there are always enough meeting rooms there is no point in including it. The service schedule’s main ability is that it can take into account the availability of resources in other schedules. On the other hand, the resource schedule can allow the user to create appointments of arbitrary length, and to create repeating appointments, abilities that the service schedule lacks. 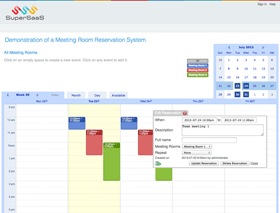 Multiple resources are required for one booking. 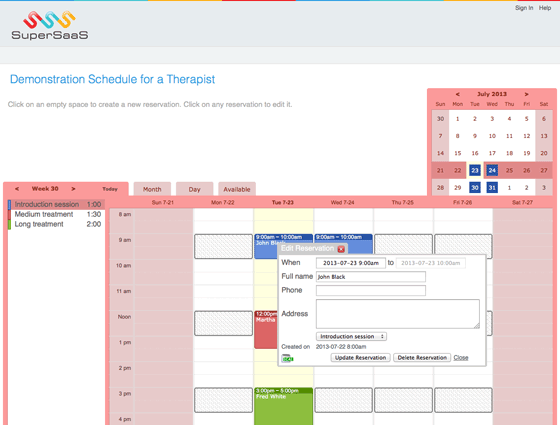 For example: a booking for a treatment requires that both a room and a therapist are booked at the same time. Different services require different resources. For example: a certain treatment can only be performed by one specific doctor. To define a service that uses multiple resources you first need to define those resources in a resource schedule. You can define a service that is not connected to any resource. If there are no resource requirements, in theory an unlimited number of appointments can be made at the same time, which is rarely useful. 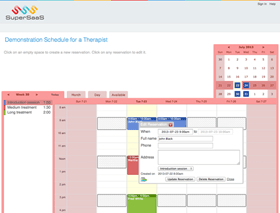 For this reason the service schedule can be configured to not allow overlapping appointments, in effect acting as a resource schedule with a single resource. This provides a convenient shortcut if you have a single resource and want to use the service schedule, for example because its calendar format works better for your purpose. A service schedule can be used to present a group of resources as a single entity. This is useful, for example, if you have 20 identical pieces of equipment for rent and you don’t want the customer to select a particular one. You have the option to give out equipment randomly, or indicate an order and give out the first one available. Conversely, two or more service schedules can be used to represent a single resource as different entities. 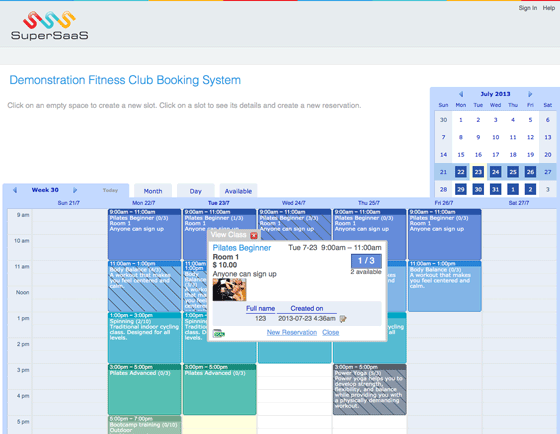 An example is where one schedule shows to members of a club and another to walk-in customers. Members could be allowed to book at a lower price or longer in advance then the regular customers. Another example would be for a consultant who works in multiple locations. She can provide each location with a schedule tailored for the client there, while still ensuring she does not get double booked. On a resource and a service schedule your users can create a reservation anywhere, except where you tell them not to, while in the capacity schedule they can book nowhere except where you tell them. 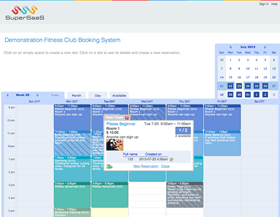 If you want people to select from just a few available dates then it may be easier to use a capacity schedule with slots of size 1, instead of blocking off all unavailable dates on another schedule type.